Jordan Roughead is someone who likes to lead by example. Outside of football, the Bulldogs’ ruckman dedicates his time to working as a mentor with Ladder, a charity which focuses on providing support to homeless youth. In 2017 Roughead was nominated for the prestigious Jim Stynes Community Leadership Award for his outstanding contribution to Ladder and he has recently joined the Club’s AFLW team as an assistant coach ahead of the upcoming season. He also returns to the leadership group at VU Whitten Oval after stepping away in 2016. The 27-year-old says that, while the promotion is humbling, a level of leadership is expected from all players. “My approach to footy and life at the Western Bulldogs doesn’t change based on my position in the leadership group,” Roughead told westernbulldogs.com.au. “Obviously I spent a few years in there and stepped away from it. Roughead is joined by captain Easton Wood, vice-captain Marcus Bontempelli and new faces Jason Johannisen, Jack Redpath and Lachie Hunter. Roughead said the leaders would provide a voice for the playing group. “It’s more being aware of what’s going on amongst the group,” said Roughead. Such a good lad. Bulldog born and bred. I have run into him a few times at a supermarket in Richmond, and he is such a nice bloke to talk to. I predict a big 2018 for Roughy. I believe Roughy has been more than average over the journey. It's not just a one-eyed assessment ( pardon the pun, almost lost an eye for us in 2016.) An average AFL player only gets to 60 games. It's a hard game on big men, and their role is not celebrated like a forward or a midfielder. 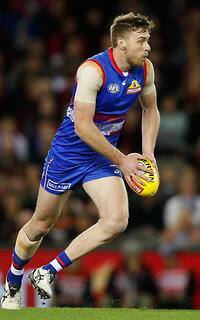 It's a team game, but in the age of celebrity guys like Roughy are under-appreciated. Was made Vice, but gave it up to focus on his footy. Wouldn't swap him for 2 Jake Stringers, but now it's time to go. I think that the 3rd man up rule change was what screwed Roughy. In 2016 he and Campbell were great at working their opponents over and negated all of the highly fancied ruckmen who could barely even get a hit out to advantage. All times are GMT +11. The time now is 10:39 AM.